This unique 3-module course covers the topics of calculus and the problem-solving techniques you need to master in an intuitive way, whether you are at high-school, college or even self-studying calculus. 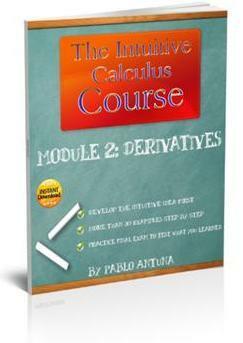 The Intuitive Calculus Course is a low cost alternative or supplement to your expensive textbooks and tutors. This unique course uses a tested method to teach you the intuitive idea behind the concepts first. After that, you'll learn all the techniques you need to solve any problem in calculus. Problems are taken from actual tests from top schools, each one with a similar one solved as an example. This will give you the necessary practice to succeed at your very next test! If you're looking for a way to learn calculus the intuitive way, and have fun in the process, this course is definitely worth checking out. 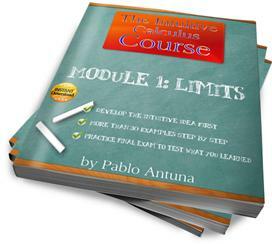 The course is organized into three modules, making it easier to handle and more accesible. These modules are in PDF format (Adobe Acrobat) and can be downloaded immediately after the purchase. You don't need to aquire all the modules, only the ones you need. However, I'm sure you'll be coming back for the others when you realize their value. As a supplement to your lectures and textbook. If you are taking a calculus course these modules are excelent as a supplement to the materials your teacher gives you. I'm sure you know that failure rate at calculus is usually higher than 50%. So, why take chances? Learn calculus the intuitive way and you'll surprise your teacher and classmates with your superior understanding and problem-solving skills! For self-study. These modules are really suited for self-study, because the intuitive idea behind the concepts are stressed and carefully explained. The examples are solved step-by-step so you can learn all the problem-solving techniques without headaches. If you plan on taking a calculus course in the future, it is a terrific idea to start early with this course! "The place to start... Master the underlying intuitive idea behind everything else in Calculus..."
This is the place to start if you've never seen calculus before. You'll learn the concept of limits and develop the skills to solve any problem that involves limits. 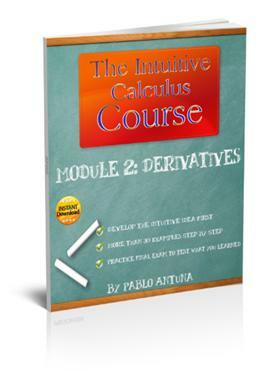 "Finally you can learn derivatives the intuitive way without sacrificing problem-solving techniques..."
After you have learned about limits, you can continue with this module. You'll develop an intuitive understanding of the derivative and then solve the kind of problems you might face on any standarized test in the world. Very few students achieve a really complete understanding of the derivative, and this is proved by the high failure rate on most calculus courses. Don't be a part of that group. Best Deal: Order Both Modules Together! Order both modules for a special price of 24.75$! With these two modules in your hands you'll be way ahead of most students. This is the best value! With these two modules you'll have the best method to learn calculus at your disposal. Don't miss this opportunity, the price might go up soon as this is a special launching price.